LARGE UNIVERSAL CEILING MOUNT ADAPTER. Converts Percheron's PR-F750 and PR-750T wall mounts infto ceiling mounts! Threads directly to standard 1-½" N.P.T. pipe (sold separately). You can use any ceiling plate that accepts 1-½" N.P.T. pipe. 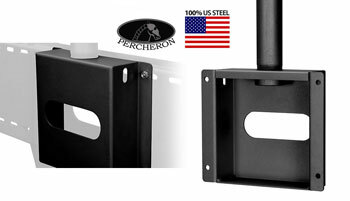 Use Percheron PR-CPL2F for new intsallations, available separately. Manufactured from 12 Gauge 100% Canadian steel. 125 lbs Recommended Max Load (up to 52" approximately). Ships complete with mounting hardware.